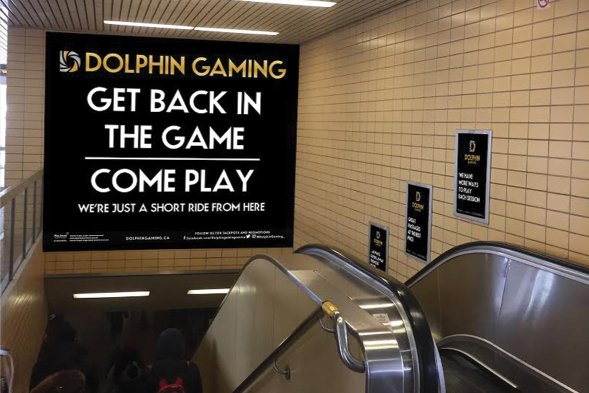 Dolphin Gaming is a family run gaming centre that features both classic Bingo and Video Lottery Terminals. They recently partnered with the Ontario Lottery and Gaming Corporation. In 2014/2015, the Ontario Lottery and Gaming Corporation began an initiative to partner with existing Bingo halls around Ontario. Being the visionaries that they are, the owners of Dolphin took this opportunity to up the stakes and create a distinctly elevated Bingo-playing experience. They beautifully renovated their space — adding in a sports bar and video lottery terminal gaming room. The issue they faced was getting a new audience for Bingo — while they could dress it up, they could not shake the stigma of the stereotypical bingo hall. Our work with Dolphin has been done in two phases. The first tackled their brand identity and web experience and the second focused on traditional and digital advertising. While their competitors stuck to the loud, obvious Las Vegas style casino imagery, with a rainbow of colour and flash, we instead went for a cool, strong minimalist look using only black, white and gold. 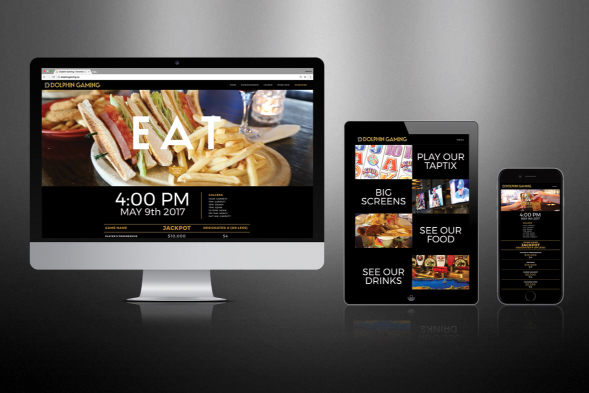 We carried this look through to their web-experience and created a polished video showcasing all the opportunities guests would have to play, cheer, eat and drink when visiting Dolphin. Phase two was about increasing brand awareness in the Greater Toronto Area. We held a series of focus groups — first to determine a new audience, and how to reach them, and secondly, to get into the mindset of the existing Bingo player. 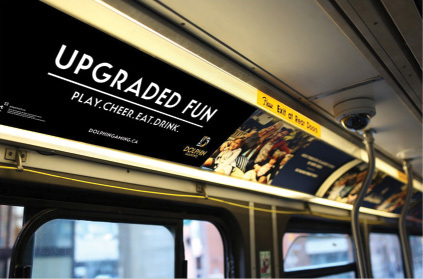 Armed with what we learned, we created a campaign that focused on three main ideas: ‘Fun is close to home,’ ‘The New Dolphin,’ and ‘More fun and games at Dolphin.’ These inspired our headlines, ‘Scarborough has Game,’ ‘Upgraded Fun,’ and ‘Play for the Night.’ These headlines can be found on fully wrapped TTC buses, in the subway, both in print and on digital screens, as well as a host of billboard across the city.